The United States Congress designated the Selway-Bitterroot Wilderness (map) in 1964 and it now has a total of 1,347,644 acres. Idaho contains approximately 1,092,854 acres. Montana contains approximately 254,790 acres. It is managed by the Forest Service. The Selway-Bitterroot Wilderness is bordered by the Frank Church-River of No Return Wilderness to the south (separated by the Magruder Corridor and Highway 12). The Bitterroot Mountains form a rugged, glacier-carved border between Idaho and Montana. On both sides of this border is the Selway-Bitterroot Wilderness, the third largest Wilderness in the Lower 48. Only the 600 foot wide Nez Perce Trail (the Magruder Corridor), an unimproved dirt road, separates the Selway-Bitterroot from the Frank Church-River of No Return Wilderness. Except for the high crest of the Bitterroot Mountains, the area is dominated by ridges broken with raw granite peaks. Below the ridges are deep canyons covered with thick coniferous forest. Hidden low valleys are rich with old-growth cedar, fir, and spruce, with Ponderosa Pine dominating open grassy slopes along the rivers. Few humans visit the huge trailless portions of this Wilderness, which makes it all the more appealing for the Selway elk herd, plus abundant deer, moose, black bears, mountain lions, and wolves. Approximately 1,800 miles of trails wind through the area providing access to both the Montana and Idaho sides of the mountains, but many trails in the area are unmaintained and rugged. Travel by foot and stock can be challenging, but rewarding, in the heart of this large wild area. Mostly within the Selway-Bitterroot Wilderness, the Wild and Scenic Selway River rushes out of the mountains of Idaho and is joined by flows from the Moose Creek drainage and lower down the Lochsa River. The Selway is a premier whitewater river offering a wild, remote, and self-reliant river experience. 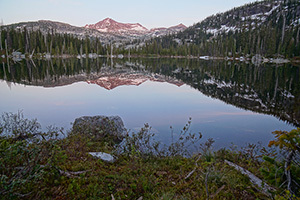 Planning to Visit the Selway-Bitterroot Wilderness? How to follow the seven standard Leave No Trace principles differs in different parts of the country (desert vs. Rocky Mountains). Click on any of the principles listed below to learn more about how they apply in the Selway-Bitterroot Wilderness.